Kate O’Neill is the keynote speaker you need to help your company adopt a winning strategy for dealing with data and emerging technology while creating more meaningful and profitable connections with the humans who do business with you. Digital Transformation: Kate speaks on strategy for human-centric digital transformation. The way it ought to be. Futurist: Kate has visionary views on the future of meaningful human experience. Internet of Things: Kate literally wrote the book on how the physical and digital worlds connect. Consulting? Workshops? Guidance? Contact us to inquire. Engaging, insightful, expert content to help a wide variety of audiences rethink their approach to technology and humanity for better business results and better human experiences. Many more topics and details listed here. 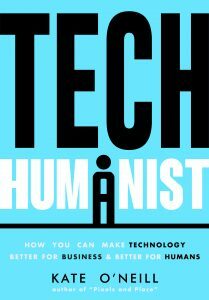 Author of several books including Tech Humanist: How You Can Make Technology Better for Business and Better for Humans and Pixels and Place: Connecting Human Experience Across Physical and Digital Spaces, Kate brings depth, breadth, humor, and humanity to data and technology topics. She bridges the gap between business interests and human needs. Her wide-ranging personal and professional experiences allow her to connect with audiences from engineers to artists, from students to senior executives. An award-winning entrepreneur, author, technologist, and strategist with a diverse and accomplished background in analytics, marketing, and linguistics, Kate has spoken for Google, McDonald’s, Cleveland Clinic, Vanderbilt University, and hundreds of technical and marketing industry conferences, association conferences and annual meetings, corporate events, and more. Founded and led by Kate O’Neill, KO Insights is a strategic advisory firm committed to improving human experience at scale. By focusing on how data and technology shape the future of humanity, KO Insights provides thoughtful and savvy expertise to clients through keynotes, consulting, and workshops. The results are human-centric, data-guided, brand-aligned, and operationally-integrated growth and retention strategies for companies and organizations of all sizes and industries. helped a fast-growing Chinese geo-tech startup with data-savvy and experientially integrative go-to-market and expansion strategy for the U.S.
and many more successful projects and initiatives. KO Insights helps organizations develop future-ready strategies that align purpose, brand, and culture with the right data and emerging technology to be more effective and efficient while creating more meaningful experiences. It may be a mouthful, but the results are worth it: that holistic approach pays off in lower customer acquisition costs, higher customer and employee retention, stronger word of mouth, and all kinds of other qualitative and quantitative improvements. KO Insights also provides guidance on the trends shaping business, technology innovation, and human experience, helping organizations develop their approach to data-rich experience design so that it is successful for the organization and more meaningful for the people who use their products and services. KO Insights is led by Kate O’Neill and enhanced as needed by an extended team that includes some of the savviest and sharpest minds around. We come together with expertise for every aspect of our experience strategy projects, combining remarkable talent from around the world. Our current and past projects combine the expertise and experiences of brilliant professionals who’ve worked in all kinds of roles across music, film, e-commerce, healthcare, technology, fashion, and consumer packaged goods across brands like Amazon, Google, Coke, Pepsi, Sony, Adobe, Nike, Volkswagen, and many more. Is your head spinning yet? These are some accomplished and impressive people. We’ll pull together the right team for you. How can KO Insights best help you? Think about where your data+experience+strategy most needs help, especially if it involves thinking about online and offline integration, meaningful use of automation, etc. Typically, companies who struggle with high customer acquisition costs, low retention rate, poor satisfaction and/or referral rates could benefit from a clearer strategy and better definition of the experience they want people outside and inside of the company to have. Through the KO Insights experience strategy consulting methodology, Kate O’Neill helps companies think about the people inside and outside their organization and align what they see, think, and do for best results. The approach is iterative, experience-rich, data-informed, insightful, and human-centric.